You’re hungry and you know there's something you're craving; a nice cool, crisp salad is what you want. You run to the fridge, open the vegetable crisper only to find the lettuce you bought just two days ago is brown and mushy. Ever happen to you? It happens more often than not and is very discouraging. In fact it happens so often that I think most people believe that's just what happens to lettuce. It's not. When lettuce is stored properly it will keep for weeks - truly. If it's a homegrown, freshly picked lettuce it will keep even longer. Actually if you have homegrown lettuce you won't (or shouldn't) pick the whole thing. Just pull off the leaves as you want them and leave the plant to continue growing. Doing this will give you an almost endless supply of lettuce through the summer months. And do you know lettuce grows all year round, even here in Melbourne? Keep planting lettuce a few at a time every couple of weeks and you'll enjoy salads all winter long and into the next spring. In the meantime, here are a few storage tips to make sure you have crisp, fresh lettuce when that craving strikes. Lettuce is not cheap. When it's not stored correctly you find yourself tossing it in the compost more often then you care to admit. Lettuce can be purchased in a bag or by the head. Either way, if not stored properly lettuce can, and will, go bad in a very short time. One way to preserve your lettuce until salad time is to buy a fresh head of lettuce. Lettuce that is in a sealed bag can turn brown faster and it costs around 15 times the price of a whole lettuce. It has already been handled, chopped or cut by a metal object (which will turn it brown) and then sealed in the bag. Often times when a bag of lettuce is purchased you can already see the edges beginning to brown before it’s even made it off the shelf. Choose a head of lettuce with lots of big, leafy, dark green leaves around it. And don't throw them out or feed them to the chooks or toss them in the compost. Wash and dry them and use them on sandwiches or in your salads. The darker the leaves the better the vitamin and mineral content so don't waste all that nutrition. Grocery stores mist their vegetables to keep them hydrated and have them sitting on beds of crushed ice. I wish they wouldn't! Having fruits and vegetables sit covered with moisture speeds up the rotting process. They may look all nice and fresh under the fluorescent lights of the supermarket, but once you get the home they not only look different, they go off in just a few days. When they sit on ice the freeze - and lettuce doesn't have to be very cold to freeze, I'm sure it's happened in your fridge from time to time. So, when it comes to lettuce especially, you are better off if it's stored dry. Always rinse lettuce before storing, but use a paper towel or salad spinner to dry the lettuce leaves before placing them in the proper container. Store your lettuce in a dry, sealable, plastic bag (ziplock or one of the green gel vegetable bags) or a container designed especially for this job. Condensation will gather on the inside of the bag even though the lettuce has been dried so line the bag or container with paper towel or a clean face washer before adding the dry lettuce. Every time you take a few leaves, dry the inside of the container, swapping the paper towel or face washer as it gets damp. This will keep a head of lettuce fresh for about a week. If your refrigerator has a crisper tray, keep your lettuce stored there. Keep the temperature of the refrigerator in the middle of your temperature scale and if you have a humidity setting you can adjust, keep it set on low. The more humidity inside your refrigerator, the better chance of the lettuce leaves acquiring moisture. If the temperature is too high you take a risk of freezing the moisture on the leaves causing them to become translucent and mushy and totally unappetising. One more thing: I suggest that you always store your salads in separate containers. 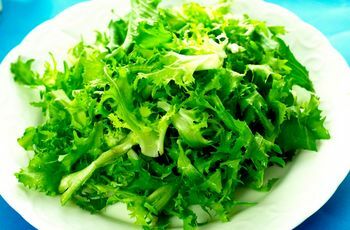 The moisture or juices from vegetables and dressings will cause lettuce leaves to wilt. There's nothing worse than craving a salad only to find your lettuce has turned brown and nasty when you open the container. Not only does it make the lettuce less appealing, but the veggies probably aren’t in that great a shape either thanks to the turning of the lettuce. By storing your salad greens properly you can have a fresh made salad anytime you wish. There's nothing like a good, healthy salad on a hot summer day. Go ahead and buy that head of lettuce today (if you don't have one in your garden) and feed your craving whenever the urge strikes, not whenever your lettuce feels up to it. A lettuce might only cost around $3 but if you buy one a week, every week for a year, that is $156 you've spent on lettuce. If you are throwing away even half that lettuce you are throwing $78 away. I know I would baulk at tossing $78 in the bin (or even the compost), how about you? Would you take a couple of minutes when you buy lettuce to ensure you get to use it all or would you rather throw money in the bin?